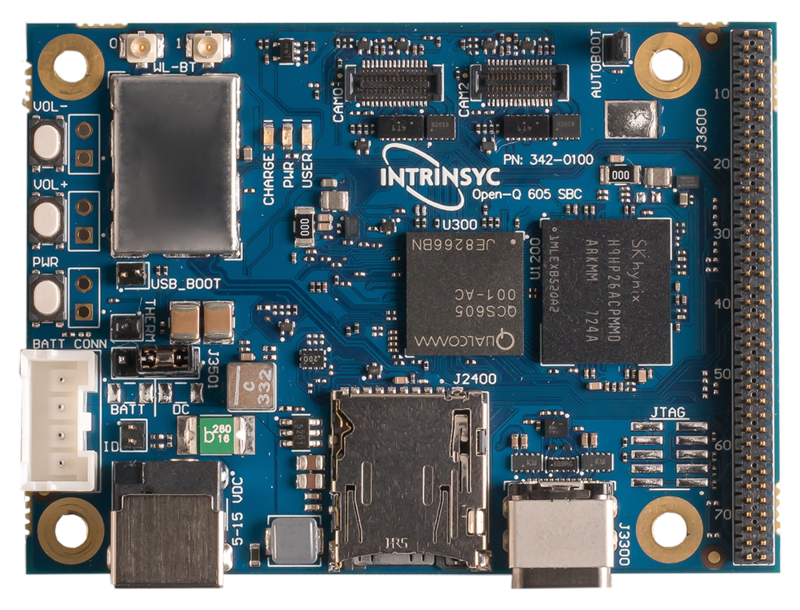 The Open-Q™ 605 Single-Board Computer (SBC) and development kit provide visual computing and edge intelligence for applications such as industrial and consumer smart security cameras, action cameras, virtual reality (VR), robotics and smart displays. The kit is a development board built around the Open-Q 605, a compact (50mm x 68mm), production-ready SBC powered by the Qualcomm® Vision Intelligence 400 Platform. The platform features the Qualcomm® QCS605, one of Qualcomm Technologies’ first family of system-on-chips (SoCs) built specifically for executing computer vision and AI on the Internet of Things. Through the Open-Q kit, developers can take advantage of the Qualcomm® Connected Camera SDK to develop and port connected camera applications and the Qualcomm® Neural Processing SDK for on-device AI, image processing and machine learning with support for 802.11b/g/n/ac Wi-Fi and Bluetooth 5 and hardware based security technologies. Intrinsyc also adds a full range of software development capabilities, including camera integration and tuning, power optimization, audio drivers and tuning, device management, and more to accelerate the commercialization of products. The kit includes a 12V power supply, quick-start guide, access to full documentation, software updates and basic development kit support. Ready for production, the Open-Q 605 SBC and development kit allow developers and OEMs to focus on industrial design and software development while shortening their time to market for IoT devices at the intelligent network edge. Qualcomm Vision Intelligence 400 Platform, Qualcomm Connected Camera SDK, Qualcomm Neural Processing SDK and Qualcomm QCS605 are products of Qualcomm Technologies Inc. and/or its subsidiaries.